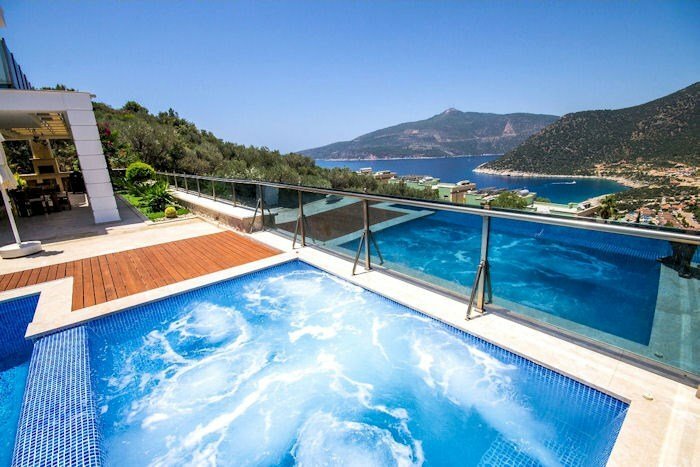 Unlock your perfect villa holiday with the Villa Luks Kalkan, a brand new, luxury designer villa just 200m from the sea in the Kalamar Bay area of Kalkan and enjoy one of the best holiday rental villas in Kalkan. All bedrooms have their very own luxury en-suite bathrooms with rainforest shower units. A top interior designer has ensured that Villa Luks Kalkan offers every luxury, with high quality furnishings and fittings designed for maximum comfort for every guest. If you can drag yourself away from the villa and pool, guests can enjoy swimming in the sea just five minutes walking away. Villa Luks Kalkan, being so close to all amenities and Villa will suit family groups of all ages, as well as couples looking for a bit of luxury and pampering. There are a a few restaurants within an easy walk plus the resort centre of Kalkan with its shops and restaurants are just ten minutes walking distance or a three minutes drive. There is a 24 hour taxi service as well.